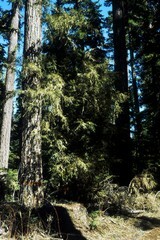 A Pacific yew tree in Mt. Hood National Forest. The anti-cancer drug paclitaxel (Taxol) was originally derived from the Pacific yew tree.